Hello! Welcome back for the second chapter of “Gunpla and Photography”! Last time we talked about backdrop and lighting so today we’ll talk about one of Gunpla’s greatest aspects- its ability to pose. Gundam models, as we know it, have varying degrees of articulations that allows them to almost replicate poses like their anime counterparts. This aspect is what makes Gundam models so incredible and fun to play with after assembly! While posing a model to your own liking is simple enough, posing it for the camera could be a bit more tricky since there are a lot more involved in order to make it aesthetically pleasing. I’ll assume it is safe to say that if you are taking photos of your work, then you probably want to share it (with people; on the internet) as well… so saying that, you also probably want it to look as best as it can! Posing preference varies between everyone and I prefer to “imitate the Gundam”- I like poses that replicates the real thing in the anime. I’ll use the MG Gundam MK II Ver. 2.0 as an example to demonstrate my points. Won’t you agree this shot looks more imposing and serious (like a Gundam should be) than the first photo? One of the main questions I always ask myself when posing my models is “How will the real Gundam look?”- In this case, how would the real thing stand? Standing is just as much of a pose as anything else, however basic it looks. When I put my Gundams in this pose, I make sure 1. the head (sightly tilting down) and shoulders (slightly tilted up) are straight and even 2. the waist is not turned 3. the hands are closed/weapons are aligned and 4. the feet aren’t pointing straight but outward and the legs are a little more than shoulder-width apart 5. the body posture is straight. This basic standing pose is actually my favorite pose because I can view the model from just about any angle and it will look good! I call these poses the “toy poses” because that is what immediately comes to mind when I see it. I’m sure you’ve seen Gundams standing like this before ^^;. Which one looks more convincing in replicating the action of the real thing? Again, how will the real Gundam look? I like to pose the model in such a “realistic” way that the fact it is a model won’t cross people’s mind or at least becomes obscured a bit. The key to posing is to make use of the Gundam’s articulation as much as possible; even if the articulation range is limited, do not just give up but work with it to find the best way for a shot. Stretch out those arms and legs! In order to pose with conviction, I think everything has to be aligned properly- the beam rifle is not pointed crookedly, the arms are straight, the head is looking in the appropriate direction, body posture is set up accordingly, the legs are spaced apart, etc. Basically, every part and position of the model should be completely intentional. If you have a well-articulated model like the MK II 2.0 then you can certainly be more creative with ground poses. I usually make it a point to exploit the model’s range of articulation for a photo shoot. If Bandai can engineer such impressive models, then I don’t need to be scared of testing its limits. If you handle the model with care, the worst that can possibly happen is loosening the joints… which is an easy fix anyway. I think the best way to see if a kneeling pose looks right is to put yourself in a kneel pose to figure it out! Actually using yourself as a model for any pose is a good way to figure out if a pose looks right or off since it gives you an idea of how it should look. The easiest way to make a Gundam looks like it is flying is just tilt the feet downward and stretch the legs apart then go from there to set up other poses. Having the Gundam tilted at an angle helps give it a sense of motion and allows you to frame a better dynamic pose than if the model is upright. Another example of a “toy pose”. I see poses like the above more often than I would like. “HM!”… or something like that. Joking aside, I think posing with melee-based weapons is easier and generally more flexible than posing with shooting-based weapons. If you want to make it look like the weapon is actually being swung, the key is in the arms and waist. Pretend that you are holding a sword. Now slash with it. How do you look? The position of your body? how is your waist turned? Your arms? Just translate that into the model and it should look more “natural” than what I did with the MK II ^^;. The standing pose that I mentioned before. You can also see this style of standing in Gundam linearts and the GFF line-up. Since the MG Unicorn Ver. Ka is known for its very limited articulation, I’ll be using it to drive home my last point of this post. Even if its knees can’t bend that far (what you see above is the maximum range), Unicorn doesn’t have to be relegated to just standing there. Like I’ve stated earlier, do not give up on posing even if articulation is limited. Just work with it the best you can. Full body shot. If the legs and arms can be stretched out, then this can help compensate for the limited movement in the knees. Limited articulation does not mean the model cannot pose! Another example to make use of the waist to make a Gundam look more dynamic. As you can see, I turned the waist so far that it looks almost unnatural at this angle but with the shield covering it from the front, you won’t notice it except that Unicorn looks really “wide” in its stance. Looks normal in this shot, right? And there I’ve covered the basics of how I pose my Gundams. The rest is all up to imagination. Before I end this chapter, here are a few examples of my favorite shots to sum up everything that I’ve been talking about in this post. Hopefully, everything I said here is understandable ^^;. There really is no “wrong” way to pose your models as it is a subjective matter and a form of personal expression so everything is entirely up to you. Just be careful and don’t be afraid to push the limits of the model’s joints for a good photo opportunity. These are just my tips on how I go about achieving the results I like out of my models and photos. So if you like this style of Gunpla photography, then I hope this post was useful to you in some way. I’ll cover the other half of the photography equation in the next chapter- Camera angles! Feel free to leave any comments or questions here and I’ll get back to you. Thank you for reading! Gunpla TV – Episode 284 – Galbaldy Rebake & Gundam 00 Diver Ace!! I thought these were all basic stuff (because I do pose my models very similar to yours. All that’s missing is SPACE TO POSE IT ON [and a stand for flight.]! ), but it seems like a lot of people just don’t have that ability to reflect DYNAMICALLY. I really like this article. One thing i think you might wanna try, if you have access to image manipulation software, is working with dynamic foreshortening. It’s a concept used in comics (among other things) where objects closer to the viewer are rendered larger than perspective permits. This creates a sense of actually being there in the viewer. You could even stitch photos together so that all of the elements in the image are in focus. Great work! Wow, thanks a lot, man! Now i clearly understand how to make my gunpla not to look like toys. Sometimes I prefer to pose the figures in relatively plain poses – often I like to show anticipatory poses as opposed to dynamic (comic-book style) action shots. Dynamic poses can be very dramatic but that’s not always what I’m after. If you think of the Gundams as “actors” – I don’t feel that action scenes are all they’re good for. When I go to a model show, the car models aren’t all drifting around a corner… The fighter jets aren’t in mid-flight, firing off a missile… The tanks aren’t lined up, firing their cannons… Even the figures tend to be in contemplative poses rather than performing some kind of kung-fu. In that kind of context, putting a Gundam into a wild pose just makes it -more- toyish. It’s attention to detail in the pose that’s key. The touches that separate a good (non-action) standing pose from a bad one can be subtle. It’s simpler, in a way, to go for a wilder pose, because a pose like that doesn’t require subtlety. @ George your basically saying the same thing Zhi is, even the slightest bit of attention to posing your Gundam will make it nice to look at, dynamic or not attention to details big or small will make a nice looking pose. From reading this i think its easy to tell that Zhi was directing this towards people that may not pay much attention to posing. People who pose their Gundam’s in a “inactive” pose for a reason like yourself for example, you already have the knowledge and you’re posing it that way for a reason. I think Zhi was trying to help people who don’t spend time posing their Gundams because they don’t really know how or they might be scared to test their Gundam’s limits. It’s actually just as you said at the end. I think a lot of folks are scared to push the limits of their kit’s poseability for fear of breaking something. A lot of the newer kits actually allow for really cool and dynamic poses if the person has the imagination for it. If you can picture it, you can probably pose it. Great tips! Looking forward to your next one. @Yuiitsu-No I would like to see some of your photos sometimes too. Mind sharing? @Josh Thanks for the idea! I should look into photo editing. Actually, I have no idea of doing even the most basic with photoshop or any photo-editing software beside resizing so I reply solely on lighting and the camera in getting the picture I want. @George I understand what you’re saying, and it seems you at least are agreeing with me on the fundamentals ^^;. I am not saying “plain poses” are bad (I did mentioned the plain standing pose is my favorite pose). This post is not just about action poses… but posing for the camera in general. The underlying message I was trying to get across is “Pose the model with conviction! Like you really mean it!”, paying attention to every detail so that it mimics the real thing as opposed to just plopping it on the table, stick a weapon, and shoot away with the camera (lack of attention to detail). I’m talking about how to make the pose look convincing, be it standing/on standby, or shooting so that it looks “good”. I could’ve used someone else’s photo as an example of a “toy pose” but that would be flat-out mean of me so I tried to imitate it with my model. The first two sentences in your last paragraph is exactly what I wanted to say in this write-up ^^. Thanks for your input! 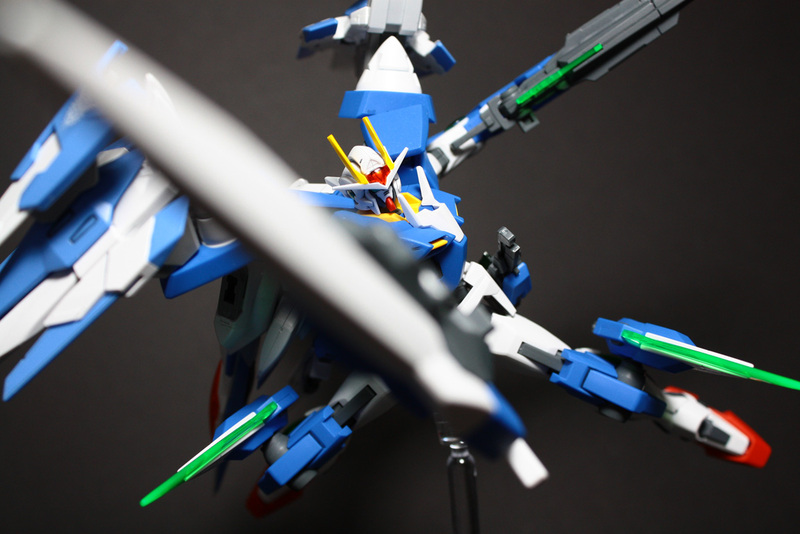 @Lex Yea… and I hope my photos can help ease the fear out so people can play with their Gunpla more! Here’s my 1/8 cents, to me, both are important. But in displays, i feel that posing is more important. When i see photos of competitions and expos, I never fail to see a beautifully built kit. Workmanship way out of my league. But, the posing wasn’t good, giving it a kinda uninteresting look. But on the other hand, I see works that are not perfectly built, good standards, but not much compared to those i mentioned earlier. The difference is, their poses are much better. In a way, it covers for the lower level of building. and “YEA! if he bent the legs a little more, pointed the gun better and changed the angle a bit, it would be PERFECT”. Saying all this, it feels as if I’m only promoting posing. But, in fact, we still appreciate the work spent into the kit. A good pose gives a dramatic boost to almost any kit. Even if it’s just a standing pose! what action base did you use? Awsome lesson Zhi…. I learnt a hell of a lot from this… theres no point me spending 2-3months painting a kit if im going to lump it into a stiff pose >< Wish i had seen this earlier! its funny how i use to always notice people horrible ways of posing their models. They do a magnificent job at building and painting the mobile suit, but their poses are just ugly! Really good post though man. Hopefully this will inspire more people to build models. I’m going to dedicate my whole winter break making a model, but havn’t decided on one just yet. 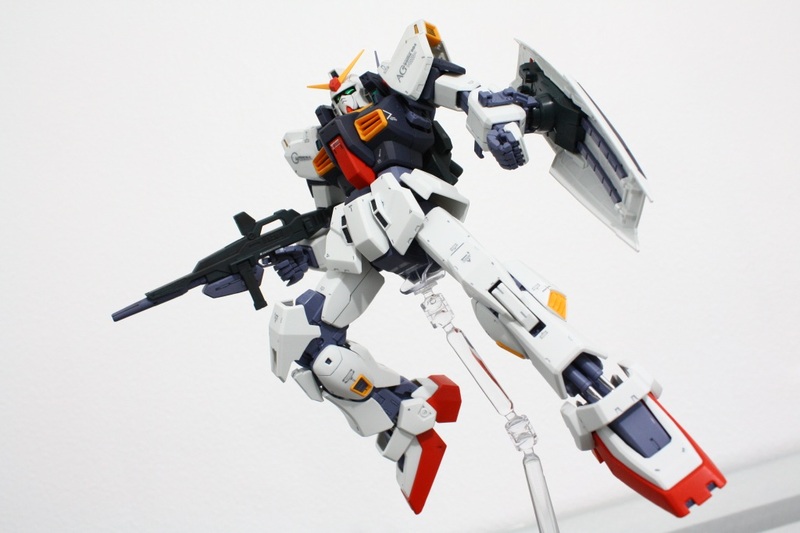 This article makes me want the AEUG gundam. @Leon I know what you mean by the posing of Gunpla at exhibitions and stuff; awesome work beyond the average modeler but posing could’ve helped ^^;. To be fair though… I think the case for that is maybe because the models are all set up by the same (group of) people running the show so time is limited? 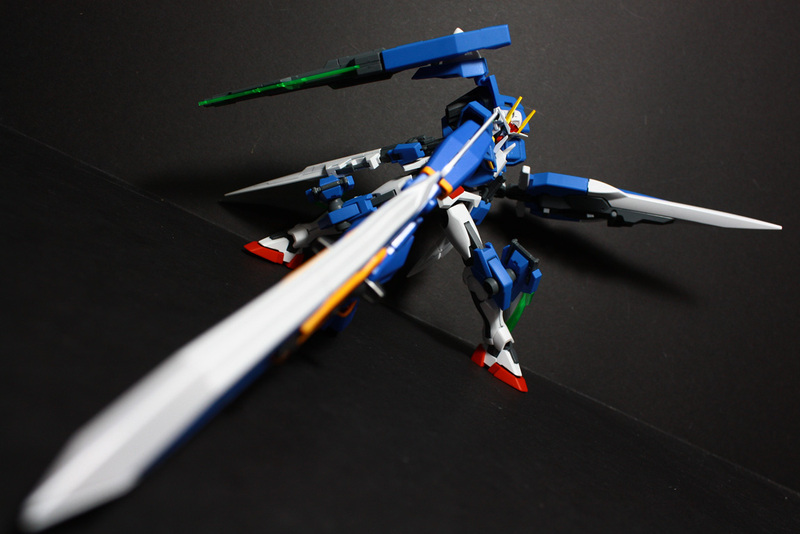 @Jeffery you got it… be one with your gunpla! @Mathai and Kamm Glad that this could be of some use. Thanks for reading ^^. Great thread. I personally never pose my kits once I get the initial pose simply because of the countless hours I spend painting. My PG 00 Raiser has over 30 hours of airbrush time and if I were to keep moving him around I would for sure scratch my paint job. So I typlically will pose my kit before painting to find the one I want, take a pic of it, then do all my painting and then final assembly back to that pose. Fantastic submission, posing of gunpla I think gets forgotten by some people but it is the posing/displaying of the model that can make an average model look great or a great model look average. Thanks for the going to the effort to put this together. I never pose Gundam in a “toy pose” because I feel it being unnatural in the surrounding setting of my living or shelf, table etc. I personally pose them like how you do. I don’t really pose them in an innate mode. I would like them to look dynamic, even just standing. My opinion, various types of mecha’s require a certain “feel” of posing. Evangelion figures/kits for example. Since Eva’s are not entirely mechanical, I pose those as humanly as possible. I want that look and feel that they’re “people”, since they’re synchronised with the pilots. @Matt I know what you mean about not wanting to scratch your paint. With the hours of effort put into it, It’ll probably feel like putting a scratch on your car ^^;. If I wasn’t reviewing models, I don’t think I’ll be posing my models either; I’ll just put it in the stance above and call it a day! @Alvin haha yea… doing the pose is a great idea so you know what feels awkward and what looks natural! @Jay Thanks for reading :). While I don’t think it is “forgotten” but in a good portion of the cases, maybe it doesn’t cross the mind? But you’re right it can make a great model look average and vice versa. However, if you are not taking photos for sharing then however the model looks good to the modeler then that’s all it matters ^^. I noticed that you used a clear stand to hold up your kits for the “flying” poses. Can I assume that you have the clear blocks too? I didn’t see any from the pics, but some of the pics are close up. I’m actually gonna get some for one of my upcoming submission. what stand are you using for almost all your shots? the clear stand that is..
btw, really helpful post there. i’m really enjoying reading and learning about your gunpla photo skills. looking forward to the next article! @Lex I actually don’t have the blocks… though I would like to know where to get them. They seem useful. @warsaza that stand is the hasegawa flexible display stand. It works for all regular sized MG models but it won’t be able to hold something like a MG Nu Gundam. It definitely looks better than the Action Base but it is also double the price and very fragile (such that it can even come damaged during shipping). Be careful if you intend on getting one. Outstanding tutorial Zhi. Thank you for taking the time to compose and share it. The best beginner Tutorial Material for GunPla…I learnt a lot thru this site…. I can’t work out if these Gundam are painted or not. I don’t see any added panel lines anywhere. I just got the PG 00 Raiser and I can’t decide what level of painting to do on it. If any. I like my gunpla to have a clean look so I don’t want to add any weathering. And the 00 Raiser has great detail in the parts themselves. These photos look great and if these models are unpainted then I’m sure the 00 Raiser will look fine without. 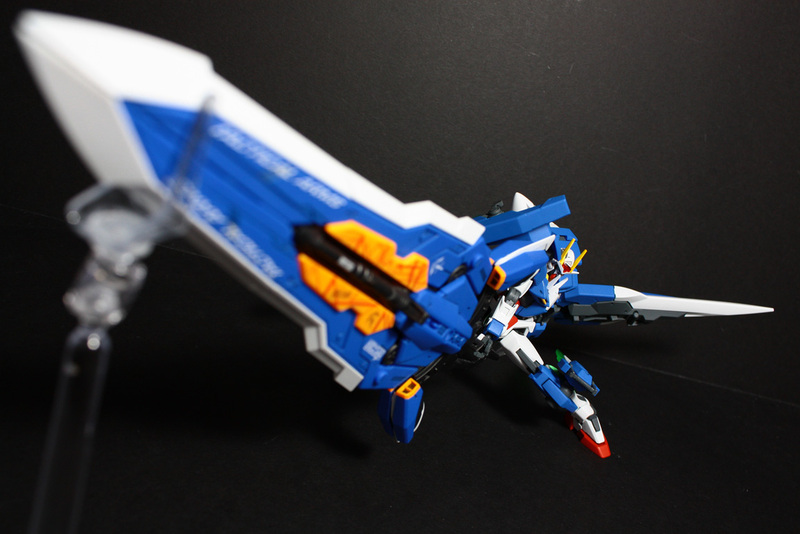 nice tips, some models like the Strike freedom are harder to pose because of the wings behind them, they make the kit unbalanced and harder to stand.